Pope Clement XIII (Latin: Clemens XIII; 7 March 1693 – 2 February 1769), born Carlo della Torre di Rezzonico, was head of the Catholic Church and ruler of the Papal States from 6 July 1758 to his death in 1769. He was installed on 16 July 1758. His pontificate was overshadowed by the constant pressure to suppress the Society of Jesus but despite this, he championed their order and also proved to be their greatest defender at that time. He was also one of the few early popes who favoured dialogue with Old Catholic Protestants and to this effect hoped to mend the schism with the Catholic Church that existed in England and the low countries. These efforts ultimately bore little fruit. Carlo della Torre di Rezzonico was born in 1693 to a recently ennobled family of Venice, the second of two children of the man who bought the unfinished palace on the Grand Canal (now Ca' Rezzonico) and finished its construction. Born to Giovanni Battista Rezzonico and Vittoria Barbarigo, his brother was Aurelio. He received a Jesuit education in Bologna and later studied at the University of Padua where he obtained his doctorate in canon law and civil law. From there, he travelled to Rome where he attended the Pontifical Academy of Ecclesiastical Nobles. In 1716 Rezzonico became the Referendary of the Apostolic Signatura and in 1721 was appointed Governor of Fano. He was ordained to the priesthood on 23 December 1731 in Rome. Pope Clement XII appointed him to the cardinalate in 1737 as the Cardinal-Deacon of San Nicola in Carcere and also filled various important posts in the Roman Curia. Rezzonico was chosen as Bishop of Padua in 1743 and he received episcopal consecration in Rome by Pope Benedict XIV himself. Rezzonico visited his diocese on frequent occasions and reformed the way that the diocese ran, paying attention to the social needs of the diocese. He was the first to do this in five decades. He later opted to become the Cardinal-Priest of Santa Maria in Aracoeli in 1747 and later to become the Cardinal-Priest of San Marco in 1755. Pope Benedict XIV died of gout in 1758 and the College of Cardinals gathered at the papal conclave in order to elect a successor. Direct negotiations between the rival factions resulted in the proposal for the election of Rezzonico. On the evening of 6 July 1758, Rezzonico received 31 votes out of a possible 44, one more than the required amount. He selected the pontifical name of "Clement XIII" in honor of Pope Clement XII, who elevated him to the cardinalate. Rezzonico was crowned as pontiff on 16 July 1758 by the protodeacon, Cardinal Alessandro Albani. In the same year, the Rezzonico family celebrated Ludovico Rezzonico's marriage into the powerful Savorgnan family. Notwithstanding the meekness and affability of his upright and moderate character, he was modest to a fault (he had the classical sculptures in the Vatican provided with mass-produced fig leaves) and generous with his extensive private fortune. 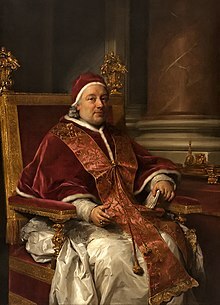 Clement XIII's pontificate was repeatedly disturbed by disputes respecting the pressures to suppress the Jesuits coming from the progressive Enlightenment circles of the philosophes in France. Clement XIII placed the Encyclopédie of D'Alembert and Diderot on the Index, but this index was not as effective as it had been in the previous century. More unexpected resistance came from the less progressive courts of Spain, the Two Sicilies, and Portugal. In 1758 the reforming minister of Joseph I of Portugal (1750–77), the Marquis of Pombal, expelled the Jesuits from Portugal, and transported them all to Civitavecchia, as a "gift for the Pope." In 1760, Pombal sent the papal nuncio home and recalled the Portuguese ambassador from the Vatican. The pamphlet titled the Brief Relation, which claimed the Jesuits had created their own sovereign independent kingdom in South America and tyrannised the Native Americans, all in the interest of an insatiable ambition and avarice, did damage to the Jesuit cause as well. On 8 November 1760, Clement XIII issued a Papal bull Quantum ornamenti, which approved the request of King Charles III of Spain to invoke the Immaculate Conception as the Patroness of Spain, along with its eastern and western territories, while continuing to recognize Saint James the Greater as co-patron. In France, the Parlement de Paris, with its strong upper bourgeois background and Jansenist sympathies, began its campaign to expel the Jesuits from France in the spring of 1761, and the published excerpts from Jesuit writings, the Extrait des assertions, provided anti-Jesuit ammunition (though, arguably, many of the statements the Extrait contained were made to look worse than they were through judicious omission of context). Though a congregation of bishops assembled at Paris in December 1761 recommended no action, Louis XV of France (1715–74) promulgated a royal order permitting the Society to remain in France, with the proviso that certain essentially liberalising changes in their institution satisfy the Parlement with a French Jesuit vicar-general who would be independent of the general in Rome. When the Parlement by the arrêt of 2 August 1762 suppressed the Jesuits in France and imposed untenable conditions on any who remained in the country, Clement XIII protested against this invasion of the Church's rights and annulled the arrêts. Louis XV's ministers could not permit such an abrogation of French law, and the King finally expelled the Jesuits in November 1764. Much the same fate awaited them in the territories of the Bourbon Duke of Parma and Piacenza, advised by the liberal minister Guillaume du Tillot. In 1768, Clement XIII issued a strong protest (monitorium) against the policy of the Parmese government. The question of the investiture of Parma aggravated the Pope's troubles. The Bourbon Kings espoused their relative's quarrel, seized Avignon, Benevento and Pontecorvo, and united in a peremptory demand for the total suppression of the Jesuits (January 1769). Driven to extremes, Clement XIII consented to call a consistory to consider the step, but on the very eve of the day set for its meeting he died, not without suspicion of poison, of which, however, there appears to be no conclusive evidence. Clement XIII backed plans to reunite the Catholic Church, with Old Catholic branches that split from Rome in 1724 over the issue of Papal authority, as well as with Protestants. This made little progress since Clement refused to compromise on doctrine with Protestants or on Papal authority with Old Catholics. In support of this policy, he recognised the Hanoverians as Kings of Great Britain despite the long-term residence in Rome of the Catholic House of Stuart. When James Francis Edward Stuart, aka James III died in 1766, Clement refused to recognise his son Charles Edward Stuart as Charles III, despite the objections of his brother Cardinal Henry Benedict Stuart. Clement XIII created 52 new cardinals in seven consistories in his pontificate. The pope created his nephew Carlo as a cardinal in his first consistory and later created Antonio Ganganelli - who would succeed him as Pope Clement XIV - as a cardinal. The pope approved the cultus for several individuals: Andrew of Montereale and Vincent Kadlubek on 18 February 1764, Angelus Agostini Mazzinghi on 7 March 1761, Antoine Neyrot on 22 February 1767, Augustine Novello in 1759, Elizabeth Achler on 19 July 1766, James Bertoni in 1766, Francesco Marinoni on 5 December 1764, Mattia de Nazarei on 27 July 1765, Sebastian Maggi on 15 April 1760 and Angela Merici on 30 April 1768. He formally beatified Beatrix of Este the Elder on 19 November 1763, Bernard of Corleone on 15 May 1768 and Gregorio Barbarigo on 6 July 1761. Clement XIII canonized four saints in his pontificate: Jerome Emiliani, Joseph Calasanz, Joseph of Cupertino, and Serafino of Montegranaro on 16 July 1767. Clement XIII died during the night of 2 February 1769 in Rome of an apoplexy. He was laid to rest on 8 February 1769 in the Vatican but his remains were transferred on 27 September 1774 to a monument in the Vatican that had been sculpted by Antonio Canova at the request of Senator Abbondio Rezzonico, the nephew of the late pontiff. From the Annual Register, for 1758: Pope Clement XIII was "the honestest man in the world; a most exemplary ecclesiastic; of the purest morals; devout, steady, learned, diligent..."
One or more of the preceding sentences incorporates text from a publication now in the public domain: Smith, Sydney (1908). "Pope Clement XIII". In Herbermann, Charles (ed.). Catholic Encyclopedia. 4. New York: Robert Appleton. Retrieved 23 June 2017. One or more of the preceding sentences incorporates text from a publication now in the public domain: Chisholm, Hugh, ed. (1911). "Clement /Clement XIII" . Encyclopædia Britannica (11th ed.). Cambridge University Press. p. 487. ^ "Rezzonico, senior, Carlo (1693-1769)". Cardinals of the Holy Roman Church. 2015. Retrieved 6 February 2015. ^ Blaikie, Walter Biggar (1917). Origins of the Forty-Five, and Other Papers Relating to That Rising (2017 ed.). Forgotten Books. ISBN 978-1331341628. ^ The Annual Register, or a View of the History, Politicks, and Literature, of the Year 1758. London: R. and J. Dodsley. 1759. p. 102. Wikimedia Commons has media related to Clemens XIII.